SAN FRANCISCO — As the boats competing in the Clipper 11-12 Round the World Yacht Race began crossing under the Golden Gate Bridge on a stopover in Oakland, news began to spread of a devastating hit the 68-foot Geraldton Western Australia took about 400 miles off the California coast April 1. On Leg 6 of the 40,000-mile race, the ship was hit by a particularly deep and nasty low-pressure system passing across the route. It was overtaken when a 100-foot wave reportedly crashed over the boat, wiping out the steering column and injuring four crewmembers, with two requiring immediate medical attention. The Coast Guard dispatched a vessel with a deck helipad to rendezvous with Geraldton Western Australia, but the weather proved bad enough to make an airlift operation out of the question. Instead, the decision was made to transport the two to San Francisco Bay on Coast Guard cutter Bertholf, where they were then transferred to Highland General Hospital in Oakland. Crewmember Jane Hitchins, a doctor from Kent, England, suffered numerous cracked ribs and vertebra in her lower back, and a ruptured spleen, but none of these injuries was considered to be life threatening. Crewmember Nik Brbora, 29, from London, was also admitted and released with a pelvic strain. Mark Burkes, 47, who was at the helm at the time of the incident, sustained a back injury, but remained on board to bring the battered yacht across the finish. Max Wilson, 62, from Queensland, Australia, suspected he had broken ribs, but stayed aboard to ride out the storm, as well. “We were racing along in 40- to 60-knot gusts,” said Juan Coetzer, the South African skipper of Geraldton Western Australia explained. “The sea was alive with rage. We were making good speed, sailing with the third reef in the main, surfing at 15-20 knots. Then, at our watch change, just before the sun came up, a monstrous foaming swell broke over our stern. “Mark Burkes was on the helm at the time,” he added. “The water had so much force in it that it pushed Mark into the helm, snapping the pedestal clean off. We had no steering, and crew were falling all over the boat. “Quickly we got the emergency steering in place,” Coetzer recalled. “Then the third reef blew, so the storm jib went up — and we pulled down the remains of our mainsail, tidied up the boat and treated the wounded. In the afternoon, a Coast Guard plane flew by and dropped us some extra supplies,” Coetzer said. 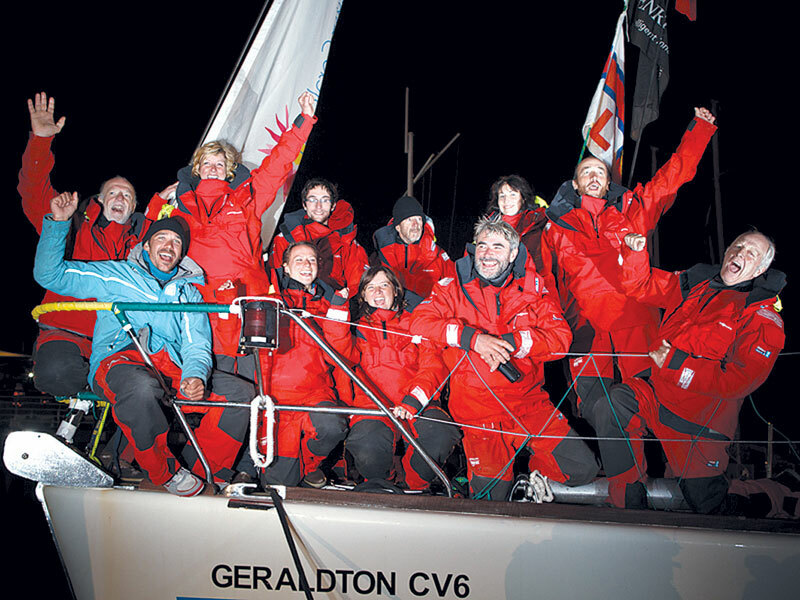 Following a dramatic 48 hours at sea, Geraldton Western Australia arrived in Jack London Square in Oakland on April 3, and the remaining crewmembers collectively breathed a sigh of relief after 30 days at sea. Round-the-world crewmember Ian Geraghty said he was pleased to be on dry land for the first time in 30 days. “The North Pacific has certainly lived up to its billing,” Geraghty said. “It’s been nearly five weeks of unrelenting cold, wet and high winds. I was down below, when the last ‘monster wave’ hit us. Water was just pouring down and everyone was in a complete state of shock once the incident happened. At press time, the crew was working at getting the boat back into working order for the April 13 San Francisco Bay restart. The Clipper 11-12 Round the World Yacht Race started July 31, 2011 from Southampton on England’s south coast and will return to the city in July after 40,000 miles of ocean racing — in the world’s longest ocean race. More than 500 racers representing more than 40 nations are competing aboard 10 equally matched 68-foot masthead cutters designed by Ed Dubois.